The Lilongwe University of Agriculture and Natural Resources (LUANAR) is inviting applications from suitably qualified persons for admission into its Bunda-Campus postgraduate programmes for the 2016/2017 academic year commencing on 10th October, 2016. 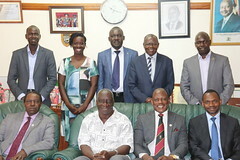 World Bank (WB) has embarked on a project which is called Africa Centre of Excellence (ACE II) whose aim is to strengthen selected Eastern and Southern Africa higher education institutions to deliver quality postgraduate education and build collaborative research capacity in the regional priority areas clustered as follows: Industry, Agriculture, Health, Education and Applied Statistics. Lilongwe University of Agriculture and Natural Resources (LUANAR) in Malawi, is hosting the Africa Centre of Excellence in Aquaculture and Fisheries Science (AquaFish) whose main objective is “to foster innovation and entrepreneurship in the production of high skilled fit-for-purpose critical mass of agricultural scientists for improved aquaculture and fisheries management in order to enhance food, nutrition and economic security in Eastern and Southern Africa”. Specifically, the AquaFish intends to achieve the following, a) train critical mass of MSc and PhD graduates who are competent to create innovations that will revolutionize the aquaculture and fisheries sector in Africa, b) enhance capacity of the center of excellence to attract national and regional students and train world class scientists that are relevant to industrial and developmental needs in the aquaculture and fisheries sector in Africa, and c) Improve innovations/technologies for increasing fish production, value addition and marketing, through partnerships. The centre will employ innovative, entrepreneurial and multidisciplinary approaches to training, research and outreach on production, value addition and fisheries management, through strategic partnerships. AquaFish Centre builds on LUANAR’s track record of serving as a regional training centre in aquaculture and fisheries science for Africa, as evidenced by hosting the AU-Aquaculture Working Group, NEPAD SanBio Fish Node, Afri-fish Net. AquaFish intends to undertake the project holistically by looking at the whole Fish value chain, hence a multidisciplinary approach. Click here to download full call.